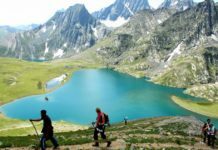 Even as the intermittent rains continue to lash Valley, the local Meteorological department here on Wednesday said that the flood threat that loomed in Kashmir is over now. 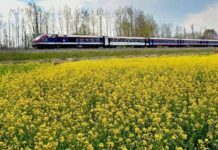 Director Meteorological (MeT) department, Sonum Lotus said that there was no flood threat in Kashmir as the weather has improved from past couple of days. “There is significant improvement in the weather conditions today as compared to yesterday. According to the prediction, there is possibility of further improvement in the weather conditions from Thursday,” he said, adding that there may be light rains at some places but overall the weather would start improving from Thursday morning. 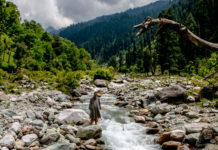 Saying that the rains in the Valley is the outcome of Monsoon season, the MeT Director told that the intermittent rains in this season would continue but as of now there is no threat of floods as per the prediction. Pertinently, the intermittent rains continued from past two days in Kashmir following the two-day sunshine here. The Irrigation and flood Control (I&FC) department has also said that the flood alert that was sounded in South and Central Kashmir was over as the water level in the River Jhelum and streams receded. Notably, following the incessant rains last week, the water in the river Jhelum and streams was flowing above the alert marking. Earlier on Monday, the India Meteorological Department (IMD) had predicted heavy to very heavy rainfall in large parts of India, including several places in Jammu and Kashmir, Tamil Nadu, Assam and Gujarat, over the next few days till Friday. Previous articleIslamic State’s Tactical Continuity in Iraq: Will it Lead to Territorial Control?